The Wombie Wookiee is a mash up of Peter Marinacci’s Wombania comic characters and a Star Wars Wookiee (Chewbacca). It started when Peter sent me this background image of Canada. Don’t ask me what it is but I said one day I would do something with it. Then a week or so ago somewhere in the blogosphere, he and I were joking and he mentioned a Wombie Wookie. So of course I planned on doing it but before I could the illustrious Cha beat me to it. Anyway here is my version. If you can’t read the Chocolate Bar he is holding it Says “Wookiee Wombie Bar – May the Chocolate Be With You. And honestly I didn’t know you spelled “Wookiee” that way until I spell checked myself cuz I know all of you would be all over me. I hope it’s a sandbox and not something else. I’ll let the wookie win on this one. I’ll happily have the chocolate be with me. I thought it would make you break out? Hey, I recognize that Wombie! He stole my chocolate bar! It was supposed to be with me, not him! That tower is one of our secret rocket launch towers that we have in Canada for our planned takeover of America. We’re coming for your chocolate factories! 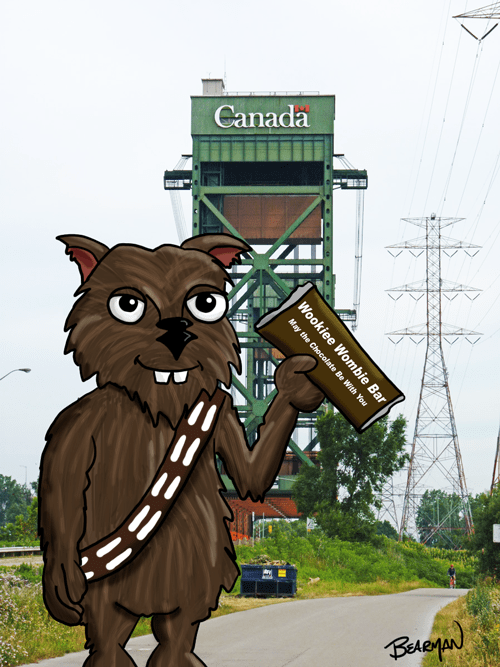 Or maybe it’s a lift bridge tower. Yeah, that’s what it is. Really. A lift bridge tower. He would give it back but it is kind of hairy. Wookies need to learn proper chocolate etiquette. This is really great Bearman! It’s hard not to love all things Wombie. I mean Wookie. No, it’s about the chocolate. Bearman, Wombies, and Wookies, oh my! Really fun, Bearman! They’re the ones I’m looking for. Chewbacca is actually one of the oldest wombats in the world at 28 years old. I have no idea to whom you’re referring. I could use a case of those chocolate bars. Does UPS ship to a boat? Looks like a bridge to me. Actually a green Canadian bridge. I think he actually said it was an elevator…grain elevator maybe?? It’s actually a bridge elevator tower. The orange bridge on the bottom rises up the tower to let ships pass underneath, There’s one tower on each end of the bridge. Love your drawing better than your friend’s (link supplied). I think this must have something to do with trains because of the tracks & it’s probably grain-related too. The train tracks are actually a guard rail for the road. And there’s no grain involved. And you like whose drawing better?? Love the slogan on the chocolate bar! Wombies do that to people. I want a chocolate chip Wookiee cookie. Sounds like something we need to go to Lucas about. Makes me homesick. For Canada. For the Original star wars. For Han Solo shooting first. For “Let the Wookiee win!”. And for Canada. Did I say Canada? Yeah Canada. Chocolate is yummy. Your Wombacca looks great, Bearman! I love it! I know what the tower thing is behind him. It’s the Wookie Wombie Choco Bar distribution point. Wombacca had to stop by to top off his supply! He could just open his mouth and let the chocolate fly in. Oh Bearman this is the BEST thing I could be blessed with today. The co-mingling of Wombies and your whimsical take on the idea. Peter has sent me wine gums and am awaiting them with glee. Your cartoon has made me smile for the first time in several days. My two favorite cartoonists in a Wookie Wombie Wonderland… with Chocolate! awww….thanks so much Rach. Hoping the wine gums and the laughs make things better for you soon!! Too many Wookiees… Stop it! PS. I could be wrong, but I’m pretty sure that in Canada we spell it “Woukie”. Well we won’t get into your education system then. Ahahah FIRST!!!! I didn’t even know… which is AWESOME. Is that a dog training command? I feel bad for the guy on the bike in the background. The Wombacca might eat him! I bet that chocolate gets fully digested faster than the Millennium Falcon can make the Kessel Run.